Monumental Marathon Review | Runner. Writer. Renegade. Like many marathoners, I like to vary which races I run, using them as an excuse for a mini-vacation twice a year. 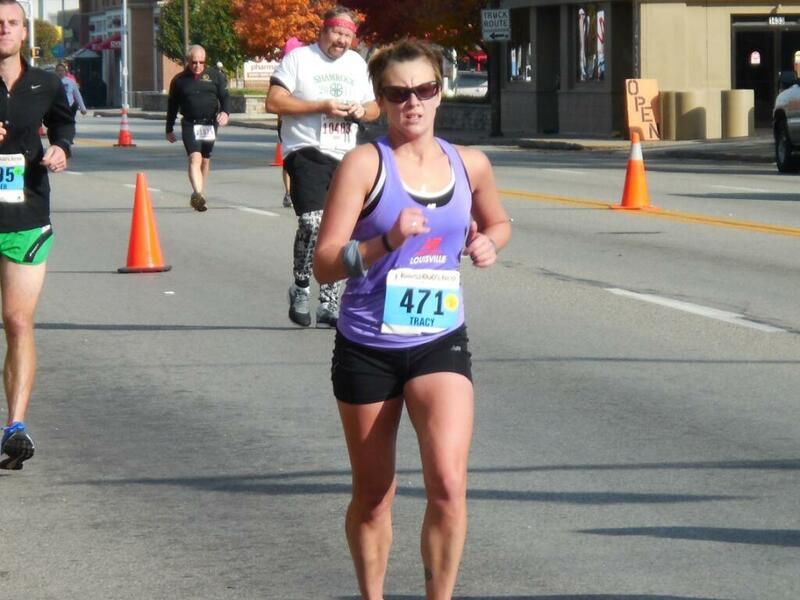 This year I went up to Indianapolis for the sixth-annual Monumental Marathon. This fairly new race had about 13,000 people in the full and half this year and it is a not-for-profit race benefiting Indianapolis Public Schools. Many of the participants are, in fact, IPS teachers and staff. Being a public school employee myself, I was inspired by that. Plus, I’m always happier to pay an entry fee that goes to a good cause. For this month’s column, I’m going to skip writing a race report and instead write more of a review in case anyone is interested in this race next year — plus where we stayed and ate. First, major props to the race organizers for a seamless registration and expo process. The expo was in the massive Indiana Convention Center, but there was ample signage to get us in the right place. Packet pickup was quick and easy, although I personally hate having to walk through the expo first — but I guess that’s the point! We stayed in a La Quinta Inn about a mile from the race start — a perfect distance for warming up for the race. The hotel staff were incredibly helpful, providing a map with restaurants and a $5 per ride taxi to anywhere downtown. We walked a few blocks to Lorenzo’s Ristorante for dinner, a small Italian joint that was predictably full of runners. The arrabiata and ravioli were both good choices. Race morning was easy — with an 8 a.m. start, I didn’t leave the hotel until about 7:30. Dropped my bag at bag check — which, unfortunately, was on the other side of the main bank of port-o-johns. This would be my only issue with the starting line area. There could’ve been port-o-johns along the way where people were coming from their hotels instead of sandwiching them altogether. And, weaving through the toilet lines to get to bag check was a bit of a pain. Bag check, though, was impressively organized. Each bag was hung up in order and the staff were friendly and quick. Volunteers with huge signs saying “ASK ME” made things easy, and I was in position in the corral with no problems. This is a good time to add that race weather was as close to perfect as you can get. All week there had been threats of rain, heavy winds and/or cold temperatures. Instead, we got low of 38, high around 50, winds from the west at 7 mph. Since it’s a north-south course, we had a light crosswind for most of the race. The first few miles of the course were tough — a lot of tight 90-degree turns with everyone still packed in together. If the race directors could find ways to straighten that out a bit, it would alleviate a lot of congestion early on. I skipped the first three water stops because it was too complicated to turn the corner, get around all the runners and get a drink. Just before mile 3, you go past the Soldiers’ And Sailors’ Monument in downtown Indianapolis, built in 1888 and just 21 feet shorter than the Statue of Liberty. It sits in the middle of a circle, and the spectators flanking the sides and up on the monument steps make you feel like you’re in a much bigger race. The half-marathon splits off pretty early — just past the 7 mile mark — and the marathoners stay along the river heading north until about the halfway marker. The Butler University campus and students are a nice distraction around mile 17, followed by a park and the Indianapolis Museum of Art. At 21, we turned east, picking up a slight tailwind for two miles — no complaints! Just past mile 23, the half and full marathons meet back up. In some races, this becomes a disaster, but the IMM organizers had cones keep half marathoners in one lane and full marathoners in the other. It did get tight at times — you could only run two or three across in each lane, so passing other runners was a squeeze. Spectators were ample and loud in the last couple of miles, although there was a 90-degree turn to get to the finish. Again, a tight squeeze, and you couldn’t really see the finish until you were practically on top of it. At the finish, they gave out traditional medals (pretty cool, there’s a spinning piece in the middle) and heat sheets, along with toboggans — knit hats, or whatever people call them in other places. That hat went directly on my head, since the finish was in the shade and 50 degrees isn’t quite warm enough to be that sweaty. Finish line food was pretty typical, although they did have chocolate milk and another treat I thought was ideal — bagel bites. Essentially, they were bagel holes, the perfect size. Picking up my gear check bag was easy; the walk back to the hotel involved a brief stop to sit and put on warm clothes. Race results were posted immediately, too. Indy has a great downtown, so for lunch we walked to the RAM Restaurant and Brewery for burgers and beers. Again, a restaurant full of runners. We’re creatures of habit, I suppose. The beer was delicious — we had some pumpkin ales and double-IPAs. That evening we caught a Pacers game — a lot of fun, but try to avoid seats in the balcony section. Getting up and down those stairs wasn’t the highlight of my day. Adobo Grill was a fun dinner place, and we wrapped up the evening with a trip to the historical St. Elmo’s Steakhouse. The restaurant opened in 1902 and remains in its current location. The restaurant is famous for its shrimp cocktail and also has a prohibition-era themed lounge upstairs. I believe a good race is evidenced by the attention to detail, and this race shines. They offered pace groups starting at the 3-hour mark, and even had them for elites trying to crack Olympic Trials times. (The oldest and youngest women’s OT marathon qualifiers were run there that day, by Colleen DeReuck (age 49) and Alana Hadley (age 16).) Instructions were provided for spectators who wanted to bike or drive to see multiple race locations. And, post-race showers were available at a nearby YMCA. All told, this is definitely a race I’d do again. It’s a little later in the year — Nov. 1 next year — and Indy is a cool city. The race organizers have definitely made this one a must-do. Pingback: Ready to Be Monumental! | Runner. Writer. Renegade.